Cozzuol et al. 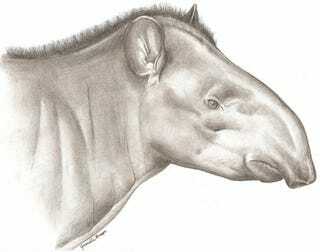 2013 is the first description of a new living species of tapir since 1865. This is a big deal. Tapiridae is one of three surviving groups of the odd-toed hoofed placental mammals, the Perissodactyla. Like their relatives the rhinos and horses, tapirs are primarily herbivorous. Unlike their relatives, tapirs are almost all exclusively closed-forest browsers; their diets are based on ground and near-ground leaves, and they live in sometimes difficult-to-traverse jungles and forests in Central America, Northern South America, and Southeast Asia. Thus Tapirus kabomani, leading its life in the jungles of Northern South America, was able to hide from detection from zoologists until 2013. As it happens, there is a partial skull and skin that was collected in 1912 (by famed big game hunter and American President Theodore Roosevelt) and hiding in plain sight at the American Museum of Natural History. The problem is that T. kabomani looks pretty similar to the nearby T. terrestris, and without a really strong morphological and molecular investigation, rumours and internet 'publications' that there was a new species of tapir didn't have a leg to stand on. This looks like it is legitimately a newly described species of tapir, increasing their global extant diversity to five species.